Anyone paddling a kayak very soon discovers the power of wind. Even a modest breeze pushes the kayak briskly along. A headwind cuts progress right down. 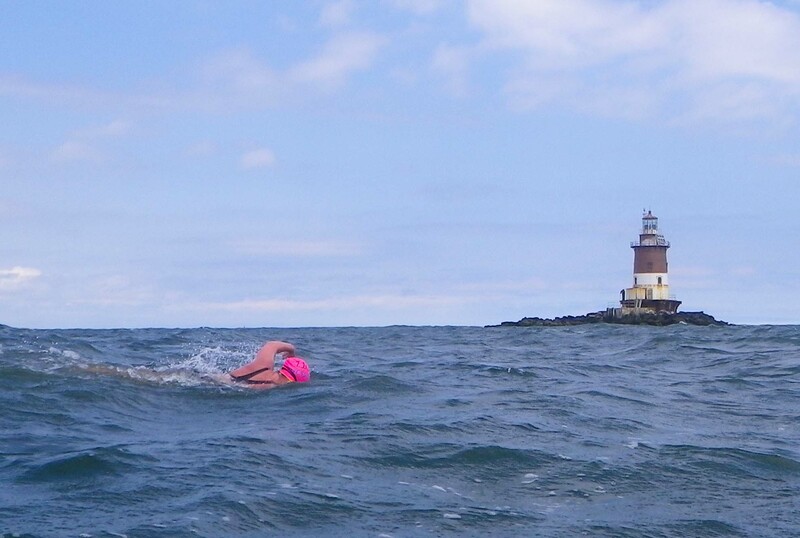 And, once the difficulties of controlling the kayak in wind and waves are mastered, a good tailwind makes the miles fly by. Since expedition kayaking is all about using the available natural forces to complete the journey in the most economical manner, why not use the power of the wind most effectively, by putting up a sail? Even purists who consider this cheating will sit up straighter in a tailwind, or hold up a jacket, or even open an umbrella. Why then not a real sail? Kayak sailing has caught on! There is now out there a huge variety of kayak sail rigs, both home-made and commercially produced, ranging from simple sails that are not much more than umbrellas to serious rigs. Most of the simpler sails are downwind sails, offering little or no cross-wind, let alone upwind, performance. 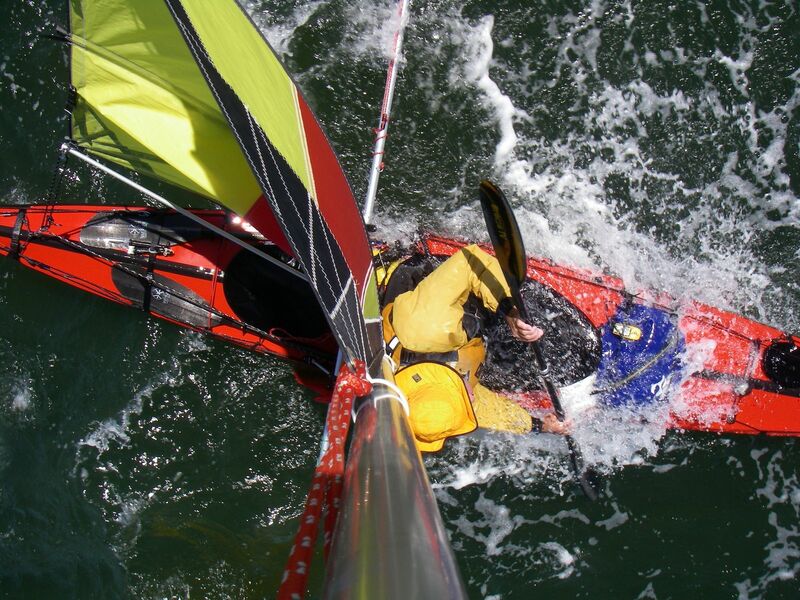 True upwind performance, comparable to that of a small sailboat, takes a true aerodynamically efficient upwind sail, and usually outriggers or stabilizers of some kind that allow a much larger sail to be mounted and used aggressively without fear of capsize. Some of the most powerful and elegant such rigs are made by Balogh Sail Designs. 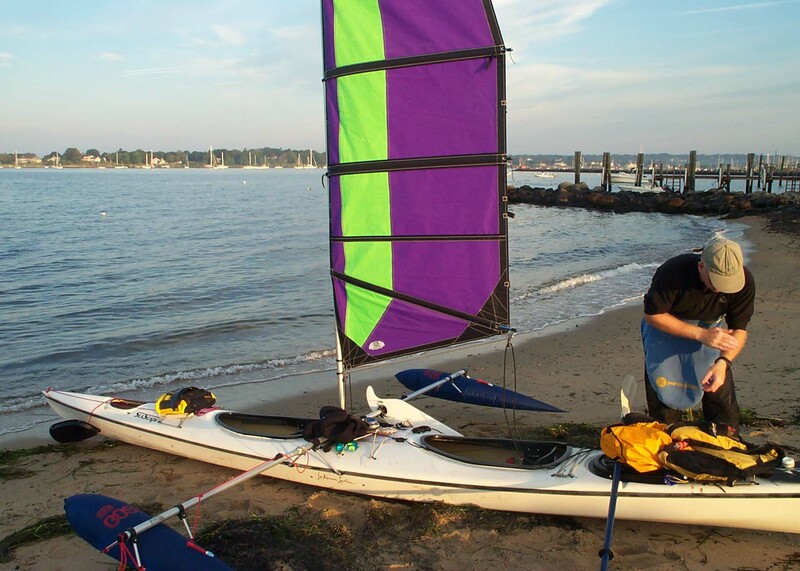 Also in conjunction with my kayak-sailing post, here’s a slideshow of a kayak sail—or rather, paddle-sail—in August 2007. During the hot, humid New York summer, I much prefer to paddle, and sail, at night. I left Pier 40 on the West Side of Manhattan before sunset, sailed up the Hudson River to the Tappan Zee, then returned to Manhattan before dawn. 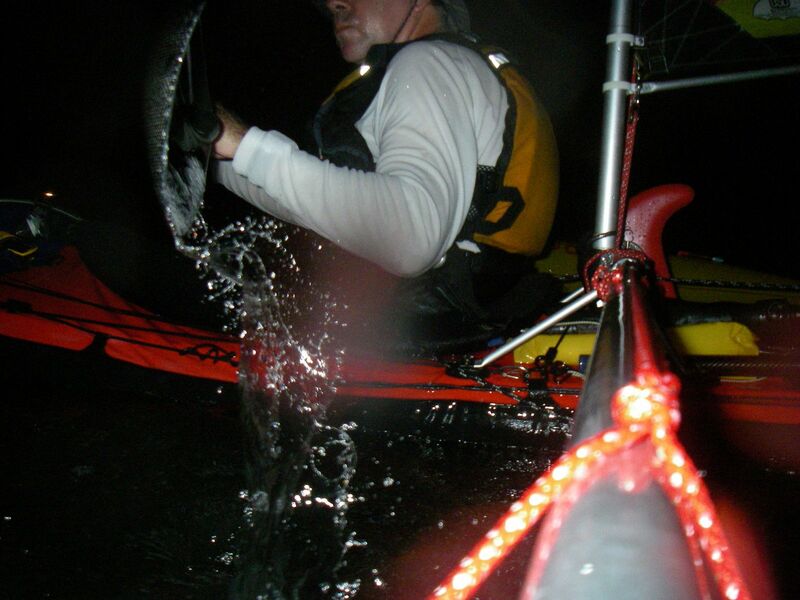 A waterproof camera, mounted on an aka of my outrigger sail rig, automatically took a photo every five minutes. These are selected images from the series. In conjunction with a post on kayak sailing, here’s the story of my very first kayak sailing trip, way back when in September 2002… I and Mark Starr sailed in a double kayak from Stonington, Connecticut, clear across Rhode Island, through Vineyard Sound and Nantucket Sound, to Chatham, Massachusetts, a distance of about 100 nautical miles. On Saturday 11 June, 2011, along with our friend Runar, we visited Figment NYC 2011, a free-form art festival that takes place annually on Governors Island in New York City (and in several other US cities). The vibe is half Woodstock, half Burning Man, with a dash of Magic Kingdom. 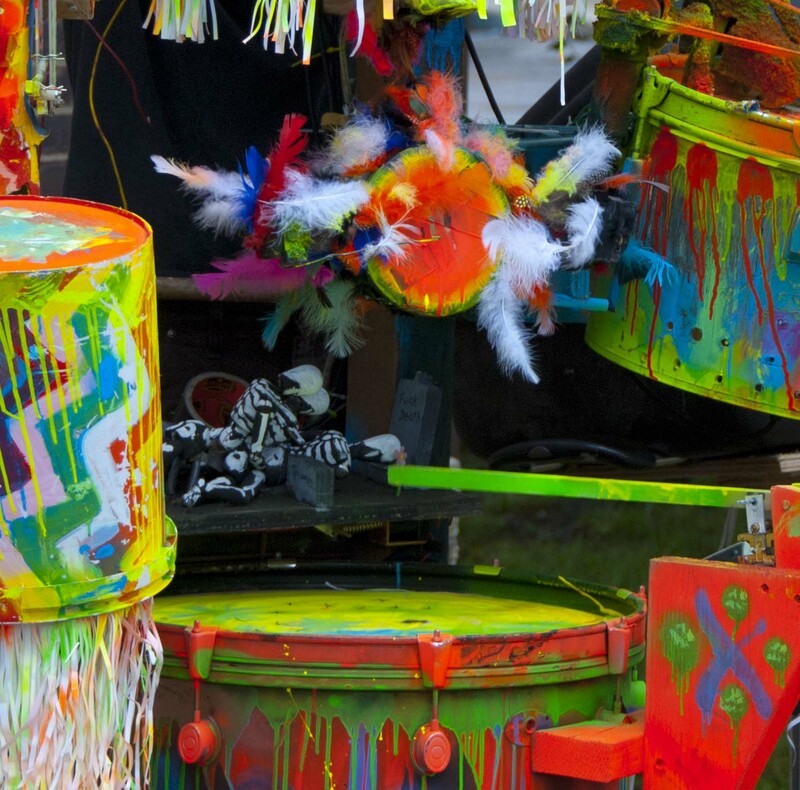 “Participatory art—what’s that?”, you ask. 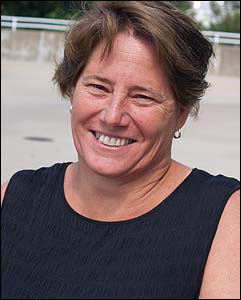 Read on: It can be anything—but most of all, it’s fun! That was our biggest takeaway from Figment… it was a hell of a lot of fun, despite the cool rainy weather. The Other Islands of New York City: A History and Guide, by Sharon Seitz and Stuart Miller. Third Edition 2011. The Countryman Press, Woodstock, VT; distributed by W.W. Norton, New York. How many islands are there in New York City? Even lifelong New Yorkers would have trouble answering this question. Several of the islands, of course, are home to millions. A few other islands have mythical fame: Liberty Island, Ellis Island, Rikers Island… But next to them, sometimes just a stone’s throw away, are many other islands. Some have long supported their own small human communities; others have colorful histories but today are inhabited only by birds and rats. 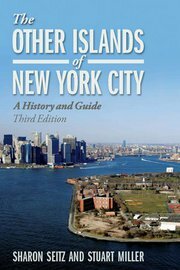 This unique book tells the histories and human stories of 45 of the “other” islands of New York City.